Presidential Peace Conference highlights the many Rotary programs that are helping to build a more peaceful world. For more than a decade, the Rotary Peace Centers have been developing leaders in peace and conflict prevention and resolution. But that program isn’t Rotary’s only contribution to a more peaceful world. Every time Rotary members provide clean water and sanitation, support basic education, grow local economies, or stop the spread of infectious diseases, they’re building peace. 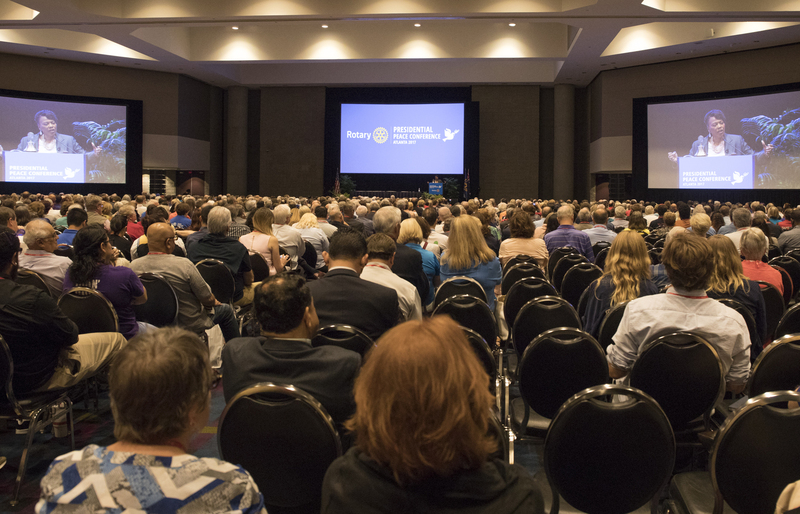 The Presidential Peace Conference, which opened today at the Georgia World Congress Center, highlights how Rotary members, our program participants, and alumni contribute to peace and international understanding. The event continues Saturday. Keynote speakers include Bernice A. King, chief executive officer of the Martin Luther King Jr. Center for Nonviolent Social Change, and Amina J. Mohammed, deputy secretary-general of the United Nations, who speaks Saturday. "Fundamental to all human interactions and engagement is respect. When it is lacking, it leads to turmoil, tension, and conflict. The pathway to peace; therefore, requires a respect for the personhood, experiences, and needs of all people," said King, the youngest daughter of Martin Luther King Jr. and Coretta Scott King. Mohammed has striven to protect the environment and promote sustainable development through several positions in the Nigerian government, and has worked with former UN Secretary-General Ban Ki-moon, the Bill & Melinda Gates Foundation, the African Women’s Millennium Initiative, Girl Effect, the 2016 African Union reform team, and the Right to Education Project. Rotary International's Presidential Peace Conference opened today. See more photos in our convention gallery. Dr. Bernice A. King, youngest daughter of Dr. Martin Luther King Jr. and Coretta Scott King, spoke to attendees at the Presidential Peace Conference. See more photos in our convention gallery. Conference participants chose from a variety of breakout sessions to learn how economic development, disease prevention, education, clean water and sanitation, and basic human rights all affect peace. One session focused on the role of multimedia in reporting conflict and humanitarian work. The occasion kicked off a series of six presidential peacebuilding conferences to be hosted by RI President-elect Ian H.S. Riseley in 2018. The first, in Vancouver, British Columbia, Canada, will focus on peace and environmental sustainability. Each of the conferences will explore the connection between peace and one of Rotary’s areas of focus. We all live and serve on the same planet. If we want to make sure that our service lasts, and our planet lasts, sustainability needs to be a priority right through all six of our areas of service, including peace. During the opening session of the event today, former U.S. President Jimmy Carter welcomed participants in a video message. Since 1982, the Atlanta-based Carter Center has been seeking to prevent and resolve conflicts, enhance freedom and democracy, and improve health. Also at the opening session, Past RI President Sakuji Tanaka led the ceremonial planting of a sapling from a tree that survived the Hiroshima bombing in 1945. The actual planting will take place Monday at the Carter Center.